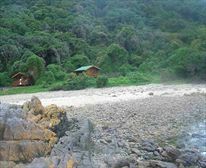 The Otter trail starts at the SANparks Storms River rest camp, which has excellent camping facilities and chalets to rent for hikers who arrive a day or two before the trail starts. The first part of the trail takes you to Ngubu hut which is 4,8kms away and normally takes 3 hours to hike. This section contains a lot of boulder hopping, with full packs care must be taken to prevent injury. After a while you will reach a large cave and it is worth taking a break here to explore. Beyond the cave the trail continues to the base of a majestic waterfall. After heavy rains, the crossing of the bottom of the waterfall can count as the first real obstacle on the trail. Otter hikers leave behind the day hikers at the waterfall and walk the short remaining distance to Ngubu overnight huts. 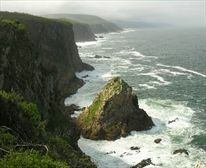 Day two of the Otter trail is probably the most varied and beautiful walk of the whole trail. It starts with a steep climb away from Ngubu and then follows a walk through a beautiful area of virgin forest. Eventually the hiker reaches the solid quartz outcrop of Skilderkrans. 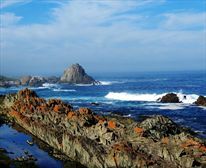 Here it is time to take a break and have a look to see if one can see any Dolphins or Whales from this incredible vantage point. After Skilderkrans the trail descends to cross the beautiful Kleinbos river before reaching the sandy shores of Blue Bay ideal stop for a lunch break. From Blue Bay a steep climb awaits the hiker but it is not long before Scott Hut comes into view, located on the Geelhoutbos River mouth. Just a little further along the coast there are some lovely rock pools to explore. The sunsets are magnificent. Day three of the trail starts of with the crossing of the Geelhoutbos river which flows next to the huts. 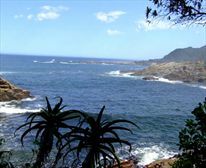 The otter trail follows the rocky coastline until the Elandsbos river is reached at about morning tea time., great place for a swim either in the brown river water or in the sea. The trail continues along the shore, passing through beautiful Fynebos until the Lottering river comes into view with the Oakhurst huts situated on the far bank. The climb down to the Lottering river crossing is quite steep while the river crossing is quite simple except when tides are exceptionally high. There are some rare rock exposures at Oakhurst. Day four of the trail is the longest. The need to reach and cross the Bloukrans river at low tide makes this day probably the most difficult depending on the time of the low tide. The distance to Bloukrans from Oakhurst is about 10Kms. This section of the trail is particularly well marked to help the hikers who may have to start out before dawn. The estuary at Bloukrans is deceptive when first seen from the cliff top by the approaching hiker. The estuary is wide with the dark hint of the river on the far side. It is important to cross the river within half an hour of low tide unless one wants a difficult swim followed by a dangerous rock scramble. 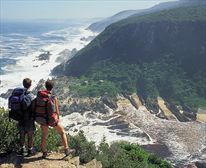 Once across the river, the hikers can take a well earned rest in the pebble cove adjacent to the Bloukrans estuary before completing the last stretch to Andre. 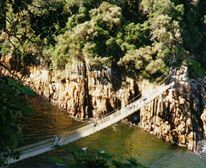 Many animals can be seen along the Otter trail, Cape Clawless Otter, Seal, Caracal, Genet, Leopard, Duiker, Bushbuck, Bushpig, Badger, Vervet Monkey, Baboon, Dolphin, Whale and a host of Bird species. Survival bags are a must and make sure that all water sensitive items such as cameras are suitably protected. The remainder of the walk to Andre Hut is only 4Km but its quite strenuous and should not be underestimated. The last leg of the Otter trail is a easy hike to Nature's Valley. It start off with a boulder hop across the Klip river before a steep climb up to the top of the cliff. From here the trail continues along the edge of the cliffs through fynebos before dipping briefly to cross the Helpmekaar river. Eventually Nature's valley comes into view and all that's left of this incredible trail is a steep decent followed by a walk across a sandy beech. The climb up to the top of the cliff looks a lot worse than it really is and shouldn't take more than half an hour. Once the Helpmekaar river is reached the trail is near the end. The final part of this trail is a nice stroll along the beach and a dip in the Indian ocean. 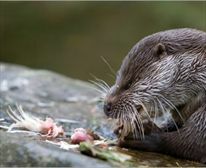 There are numerous streams and springs throughout the length of the Otter Trail that are suitable for drinking purposes. However, it may be wise to use purification tablets especially if you are not used to this water and where streams/rivers pass through communities such as the Coldstream\Witels River (3.6 km mark of the 4th day) and the Lottering River (7.5 km mark of the 4th day). There are rainwater tanks at each overnight hut that may also be used. However, due to erratic rainfall patterns, the level of these tanks may be low from time to time. Firewood is provided, however it is not covered from rain and therefore may be wet. Hikers are required to carry their share of wood from a woodpile, close by on the trail. However, it sometimes happens that there is a buildup of excess wood not used by previous hikers that is placed under the steps of the huts, which is usually dry. Each hut has a braai place with a sturdy steel grid. Within each hut there is a table on which food can be prepared. Hikers need to provide their own gas stoves and pots for cooking. There are two huts and a single toilet at each overnight stop. Each of the two huts contains 6 beds with mattresses - hikers must provide their own blankets/pillows/sleeping bags etc. Rubbish bins are provided at each of the overnight stops. Field rangers remove the rubbish regularly. There are benches present. Please only use biodegradable soaps on the trail. It is important to be aware of the tide times prior to hiking the Otter Trail. This is especially important when it comes to crossing the big rivers, Elandsbos and the Bloukrans Rivers. This tour start at the Sanparks Storms River restcamp, let us know if you require transport to the Storms River. There is no reception at the overnight huts. Cellphone reception is intermittent along the Otter Trail. Reception may be picked up when the trail reaches up onto the plateau or when the coastline juts out to sea. 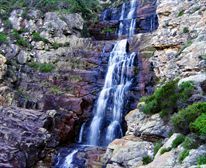 If you looking for a hiking trail in Cape Town, the hoerikwaggo trail is a must.